Samsung has carved out space for itself in the smartwatch segment with its renowned Gear series which has a host of options. If you’ve been watching the marketplace for buying one of these smartwatches, you’ll be delighted to know that the latest generation of Samsung’s Gear smartwatches – Samsung Gear Sport is available at its lowest price so far. 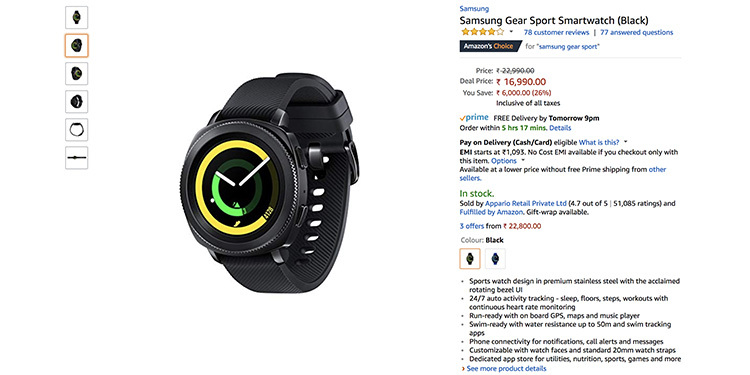 As part of the ongoing Amazon Prime Day sale, the Samsung Gear Sport can be bought for a price of Rs. 16,990. As the name suggests, the Samsung Gear Sport is a smartwatch with features aimed at tracking vitals during physical activities. Pitted against the likes of Fitbit Versa and the Apple Watch, Gear Sport gets features essential for tracking exercise-related activity. These include a continuous heart-rate monitor and even the ability to keep a track of your swimming activity. The Samsung Gear sport comes with a circular 1.2-inch Super AMOLED display. It packs in a dual-core processor clocked at 1GHz along with 768MB of RAM. The smartwatch comes with 4GB of internal storage for storing music and apps, and uses a 300mAh battery for daily use. The Gear Sport is smart enough to identify your activity and even shows reminders about armchair workouts, easily distinguishing between just sitting and other activities like driving. It also features a sleep tracker to help you improve the quality of your sleep. The Samsung Gear Sport comes with inbuilt GPS to help you map your jog or cycling spree, besides capturing essentials such as the number of steps, distance traveled, and calories burnt. It can also help users track their diet and calorie intake and suggest what to and what not to eat. It is built upon Samsung’s own Tizen OS which also powers other Samsung Gear smartwatches including the flagship Gear S3. Apart from these features, the Samsung Gear Sport alerts users about incoming notifications as well as message and call alerts and supports a wide range of watchfaces. The smartwatch usually sells for Rs. 22,990 but it can be bought for just Rs. 16,990. So if you want to score the Gear Sport smartwatch, be quick to act as the deal won’t last long.